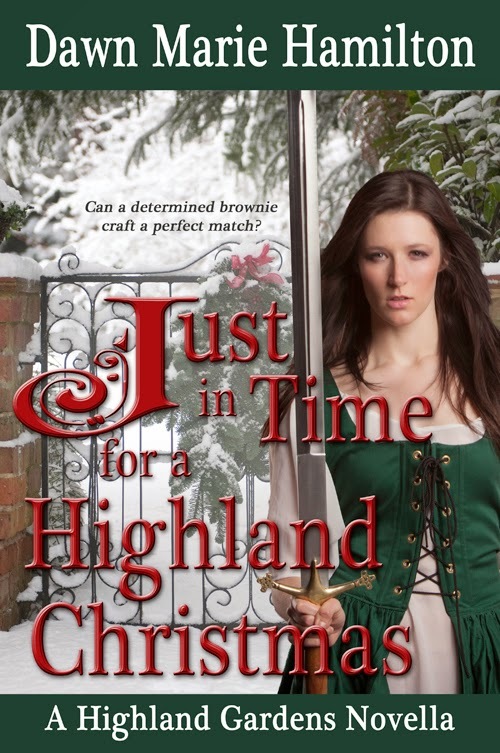 Just in Time for a Highland Christmas—a Scottish historical time travel romance with Highlanders, scheming faeries, a mischievous brownie, magic, adventure, and romance set in 16th century Scotland and the Blue Ridge Mountains of North Carolina. “Can we make snow angels?” Scott hollered over bantering voices. “Yes, please,” Young Iain begged too. Laurie urged the lads into jackets and the entire family trudged out into the snowy garden. Patrick flicked a switch. Light illuminated the area, making the snow sparkle. The lads fell onto their backs in the snow, waving their arms and legs. The imprints left behind were the images of angels. Laurie made a large one. Patrick’s even larger. If a once powerful warrior could display a playful side so could she. Isobell dropped onto her back to make an angel of her own. To her utter surprise, Archie threw off his plaide and plopped beside her in naught but his trews and leine. As they spread their arms to make angel wings their fingers touched. Their gazes met. A thrill shot through her. Archie’s eyes flared. He must have felt it too. Archie grabbed his plaide and they slipped away from the others frolicking in the snow. She guided him through the inn’s garden, along the well-trodden woodland trail, through the meadow and into Laurie’s garden and the privacy of the orchid room. Was doubtful the family or guests would visit on this most special of nights—Christmas Eve. “Why have you brought me here?” he asked. “Why do you think?” She hoped her smile appeared sensual. He raised a brow. She pressed against him, grasped his hands and pulled his arms around her, placing them on her bum. His response, a firm squeeze, urged her on. Stretching up onto the balls of her feet, she leaned in and kissed him as sweetly, as passionately, as her heart demanded. A rough sound erupted from deep within his throat, a growl, a demand, and the kiss intensified into a meeting of mouths and tongues, wet and wild. Isobell’s breath came from Archie and his from her. When the fever calmed, forehead resting against forehead, they gasped for air. “Oh, aye!” She melted against him. He glanced around the small glass chamber then stepped away. He grabbed a cushion from one of the chairs and tossed it on the floor. Then another and another. Using all the cushions, he made a fine bed. She fell on knees on the cushions beside him. Suddenly feeling shy, she tentatively touched his smooth cheek. She had no experience seducing a man. “Aye.” She lowered her gaze embarrassed for having believed all the lies.